I’m a sucker for unexpected ice cream flavors (exhibit a). And, I don’t know about you guys, but whenever we had Neapolitan ice cream at various summer camp type events as a kid, we always went straight for vanilla or chocolate. Strawberry got left behind. I always felt bad for it and its weirdly pink hue, like it was blushing. It’s cool, strawberry. I know what it’s like to be picked last in sports. Sorry, that got surprisingly real surprisingly quickly. 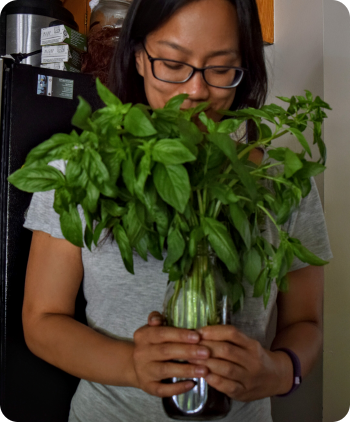 Anyways, with a glut of strawberries from our CSA that were past their prime and David Lebovitz’ talk about how miso in ice cream would give me a “rich butterscotch flavor,” I was sold. So, into the oven went my strawberries, with a hint of vinegar, while I dug around my fridge for the mildest miso paste I could find. 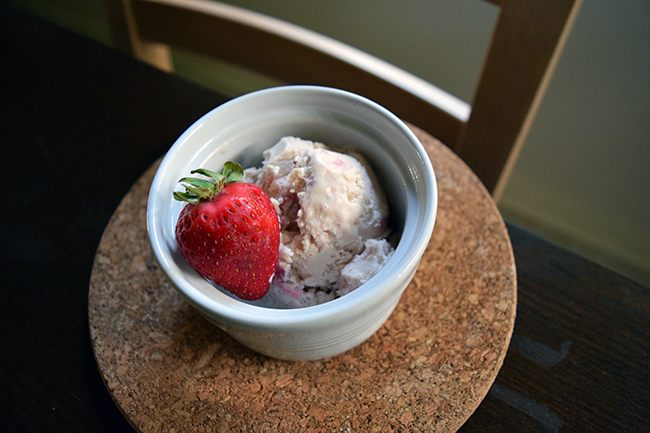 Roasting the strawberries intensifies their flavor and reduces their water content, so you end up with ice cream that tastes like actual strawberries that’s minimally icy. And the miso? It’s definitely noticeable, but it’s this slightly salty, funky, rich sense you get eating the ice cream. But it’s good. I brought a bunch to a BBQ hosted by a friend, and unexpectedly, the kids went wild for this flavor. Maybe kids just like ice cream? 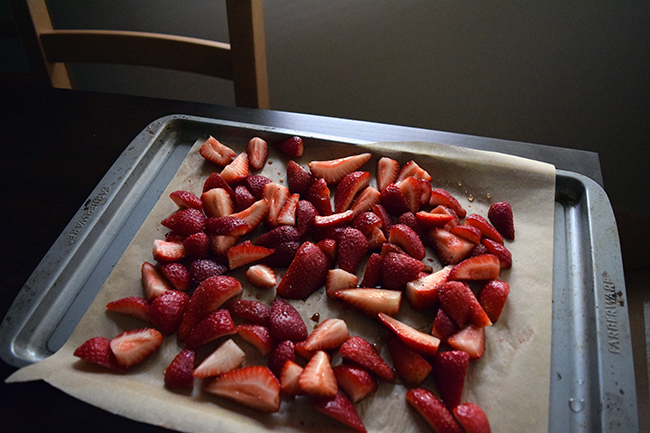 First, roast the strawberries. Preheat the oven to 375ºF. Remove tops of strawberries and quarter them. Scatter the berries onto a baking dish and toss with sweetener, vinegar, and pepper. Roast in the oven, leaving mostly undisturbed (you can turn them once or twice) until the juice has released and thickened, about 40 minutes. Remove from the oven, scrape into a bowl, and let cool. Once they’re cool, you can cut the berries up using a knife or scissors (straight in the bowl works). Then, make the ice cream custard. Heat the milk and sugar in a saucepan over low heat. In another, whisk together the egg yolks and miso. Temper the eggs by pouring a bit of the warm milk into the yolks, whisking constantly. Repeat until the yolks are close in temperature to the milk. Then, pour the warmed yolks back into the saucepan. Cook over low heat, stirring constantly and scraping the bottom with silicon spatula or wooden utensil. Heat until you the mixture coats the back of a wooden spoon and you can draw a line through the coating. (If you have a thermometer, this is around 165˚ to 170˚ F. Pour the custard into the bowl of heavy cream. Stir (still in the ice bath) until cool. Let the mixture chill completely in the refrigerator, preferably overnight. To finish the ice cream, mix in the roasted strawberries into the custard. Churn in your ice cream maker, and then let the finished ice cream harden up in the freezer, preferably overnight.